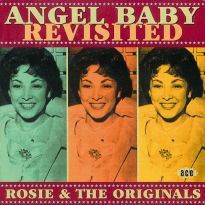 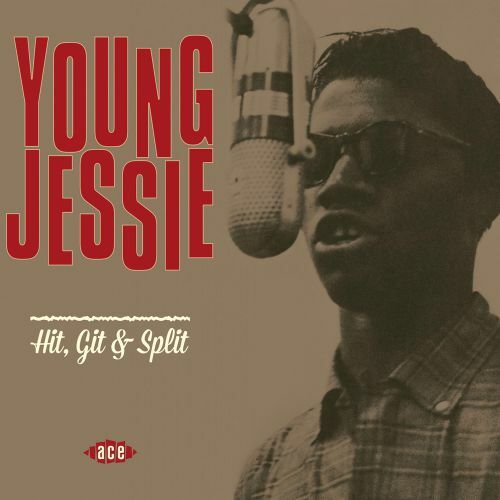 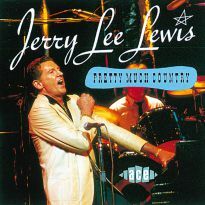 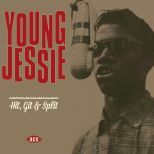 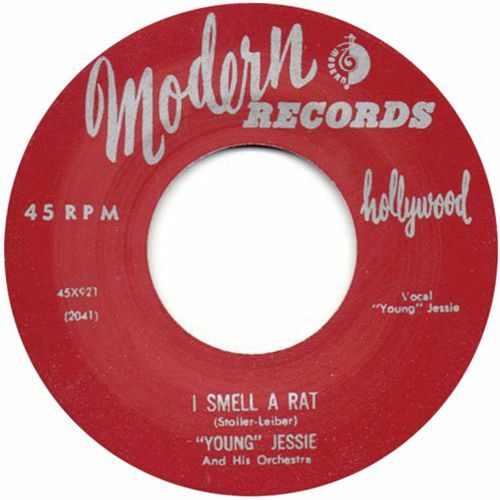 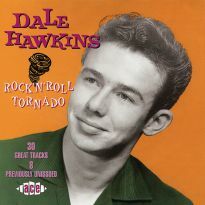 One of Ace’s first R&B albums, now remastered – Young Jessie’s tough R&B recordings from the late 50s. 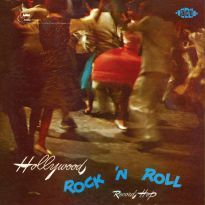 Pressed on 180g red vinyl, with expanded notes on inner bag. 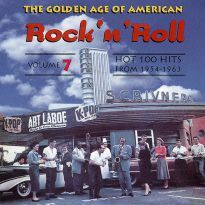 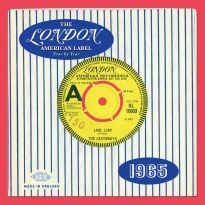 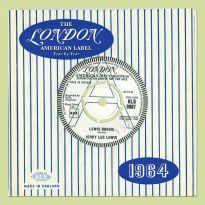 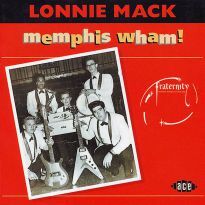 “Rock and roll is here to stay” sang Danny & the Juniors, expectantly, in 1957, but they could have had no idea that 25 years later it would have largely relocated to the UK where a whole new bunch of teens would be digging it in a whole different way. 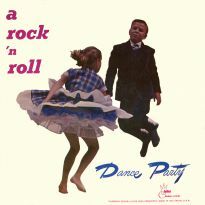 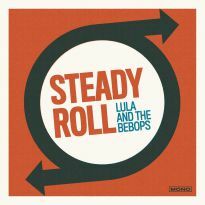 Throughout the 70s there had been a long slow rock’n’roll revival that pretty much depended on the original canon. 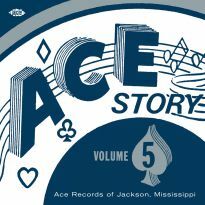 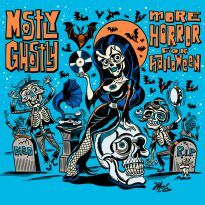 But gradually, and thanks to reissues on Ace and other labels, the more arcane aspects of the music became popular in clubs and dancehalls. 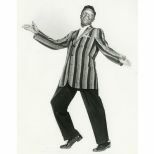 First of all, rockabilly hiccupped its way to prominence, and then, as the twitching right leg became all too familiar, a different swing was introduced, and dangerous R&B became all the rage. Teenage angst was replaced with knowing innuendo, and frenetic slap bass and thrashing guitar with an altogether more sly and sinuous groove. 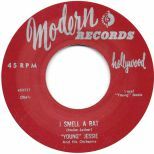 This is where Young (Obediah) Jessie came in, and they don’t come much more sly and wicked than him. 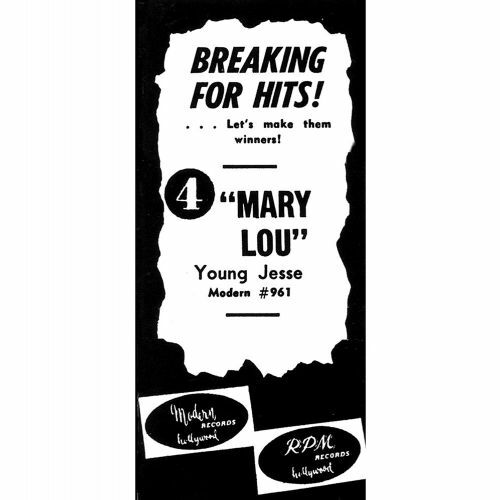 From the hipster slang of the title track, to the tale of Mary Lou who “clipped the judge just to pay her bail”, this ain’t kids’ stuff. 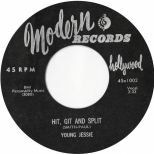 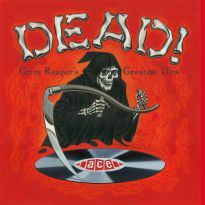 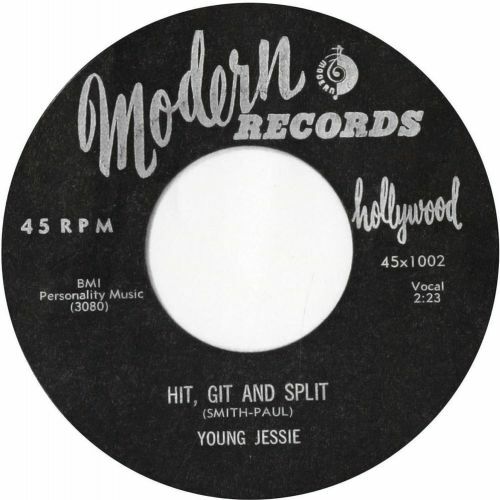 Hence in 1982 Ray Topping and Ted Carroll assembled “Hit, Git & Split”, the first Young Jessie LP dedicated entirely to his records and drawn from the Modern label where he waxed through the mid-50s. 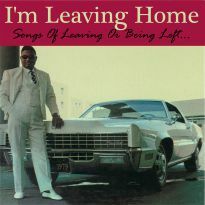 This is prime Los Angeles R&B at its finest, hip but not too slick and straight off the street. 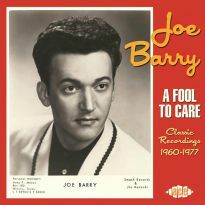 Most of the material is written by him, with a few sides penned by those masters of hip, Leiber & Stoller, and the whole thing goes off with a swing. 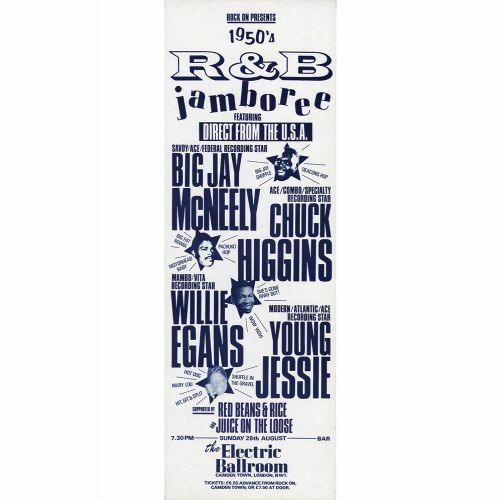 In 1983 Ted put a show on at London’s Electric Ballroom that featured Young Jessie along with Willie Egan, Chuck Higgins and Big Jay McNeely flippin’ his wig – hey, everybody flipped their wig that night, even the bald guys. 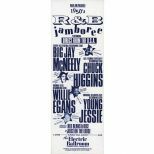 Since then he has been a regular around the live rockin’ circuit, and he came back to London 30 years later to play a sensational show for Jazzman Records, backed by Big Boy Bloater. 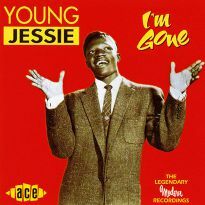 And so it rolls on, with each generation getting hip to the sound of Young Jessie, and long may they do so.